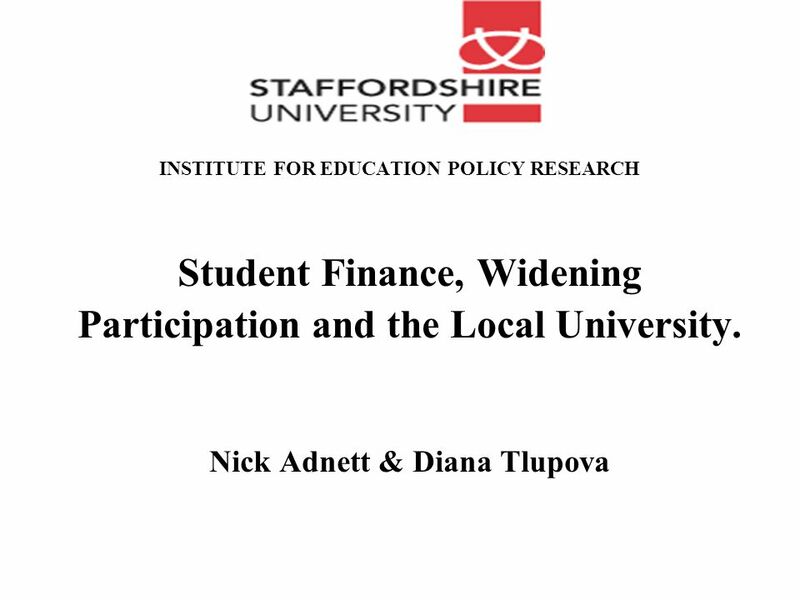 INSTITUTE FOR EDUCATION POLICY RESEARCH Student Finance, Widening Participation and the Local University. Nick Adnett & Diana Tlupova. 4 THE NEW STUDENT FINANCE SYSTEM AND WIDENING PARTICIPATION Variable Tuition Fees Income-contingent Loans THE NEW STUDENT FINANCE SYSTEM Maintenance Grants Bursaries (£115 m in 2006/7) Government target – to switch more of HE funding on to students and their families whilst increasing HE participation to 50% of those aged 18-30 by 2010. To achieve the latter by increasing participation of groups currently under-represented in higher education and achieve ‘fair access’. 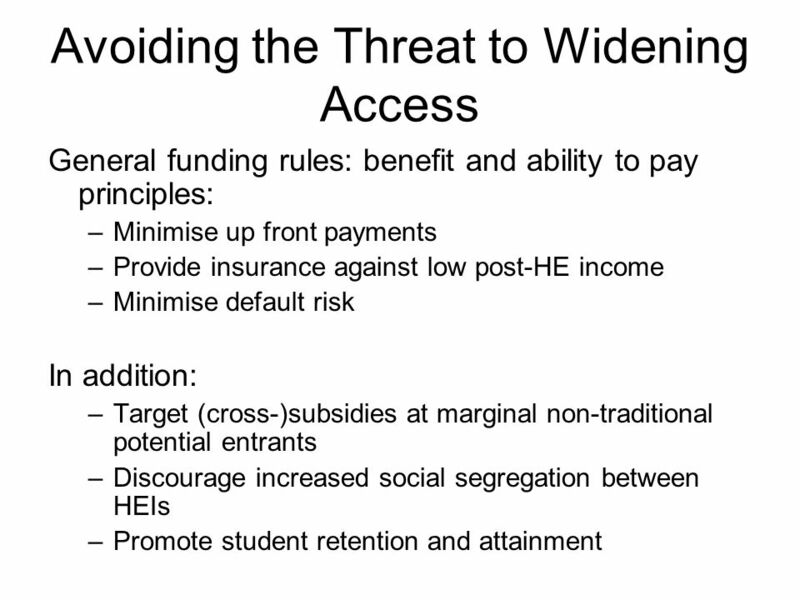 5 A Threat to Widening Access? Non-traditional potential entrants more likely to be: –poorly informed about risks and returns –borrowing to fund HE –more debt-averse / risk-averse –lower returns to graduation? Hence ceteris paribus: –less likely to participate –more likely to choose low cost & low risk HE favour local HEIs and low fee, short-duration & vocational courses whilst continuing to work part- time. 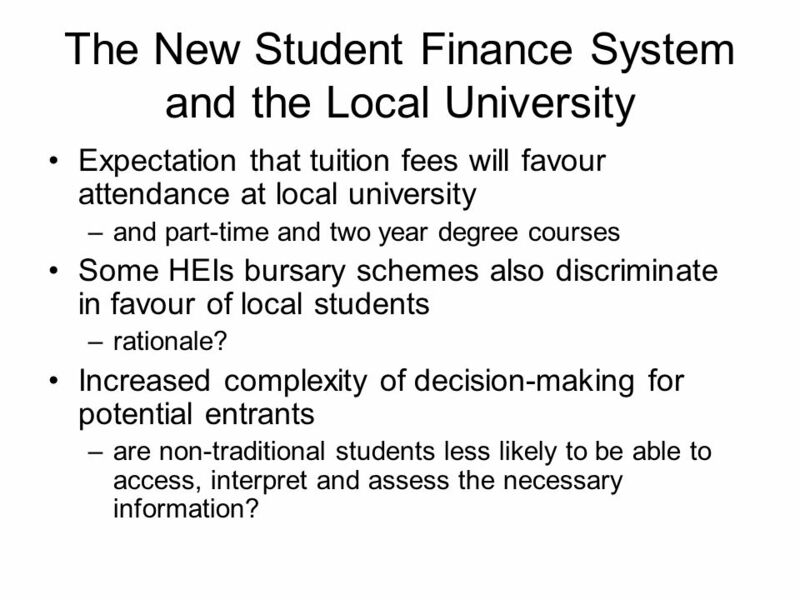 8 The New Student Finance System and the Local University Expectation that tuition fees will favour attendance at local university –and part-time and two year degree courses Some HEIs bursary schemes also discriminate in favour of local students –rationale? Increased complexity of decision-making for potential entrants –are non-traditional students less likely to be able to access, interpret and assess the necessary information? 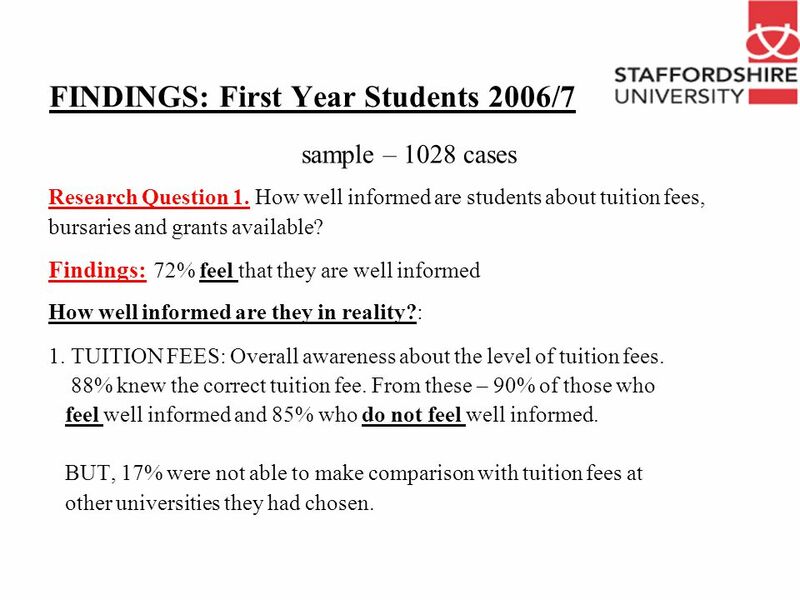 10 FINDINGS: First Year Students 2006/7 sample – 1028 cases Research Question 1. How well informed are students about tuition fees, bursaries and grants available? Findings: 72% feel that they are well informed How well informed are they in reality? : 1. TUITION FEES: Overall awareness about the level of tuition fees. 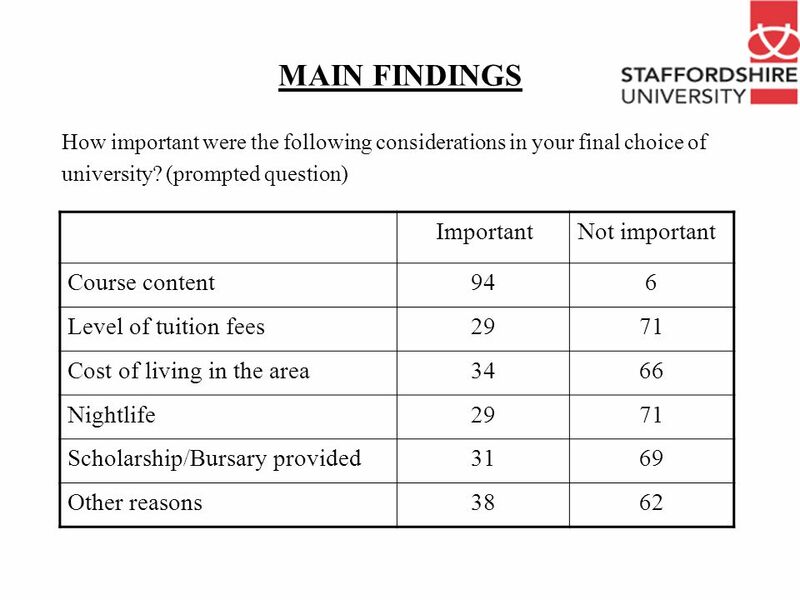 88% knew the correct tuition fee. From these – 90% of those who feel well informed and 85% who do not feel well informed. 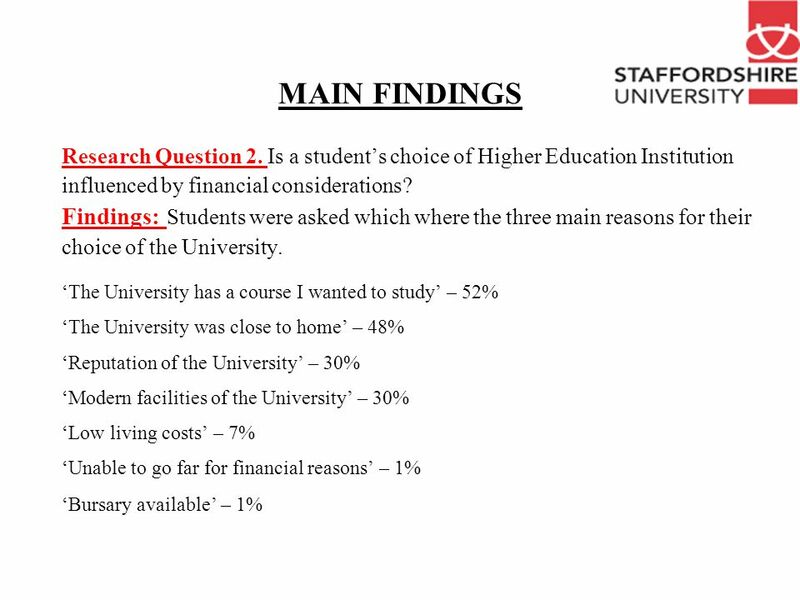 BUT, 17% were not able to make comparison with tuition fees at other universities they had chosen. 11 MAIN FINDINGS 2. 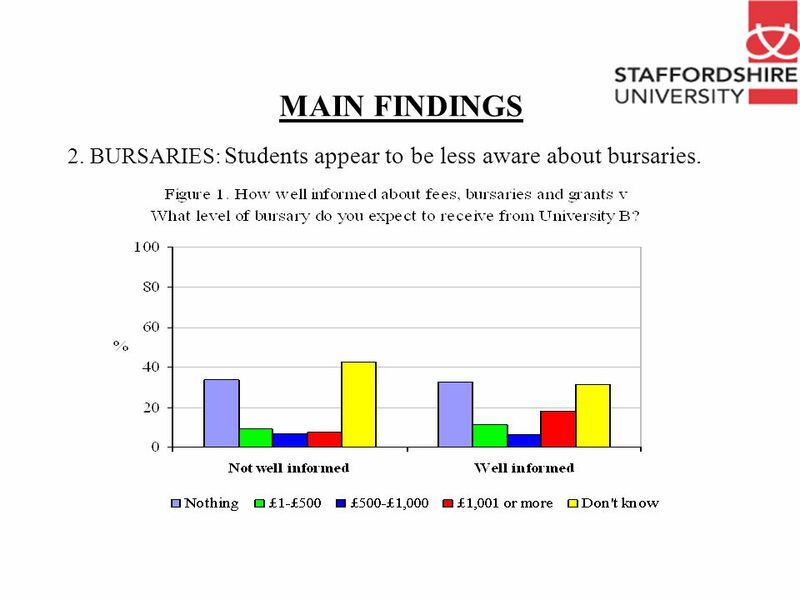 BURSARIES: Students appear to be less aware about bursaries. 12 MAIN FINDINGS 3. 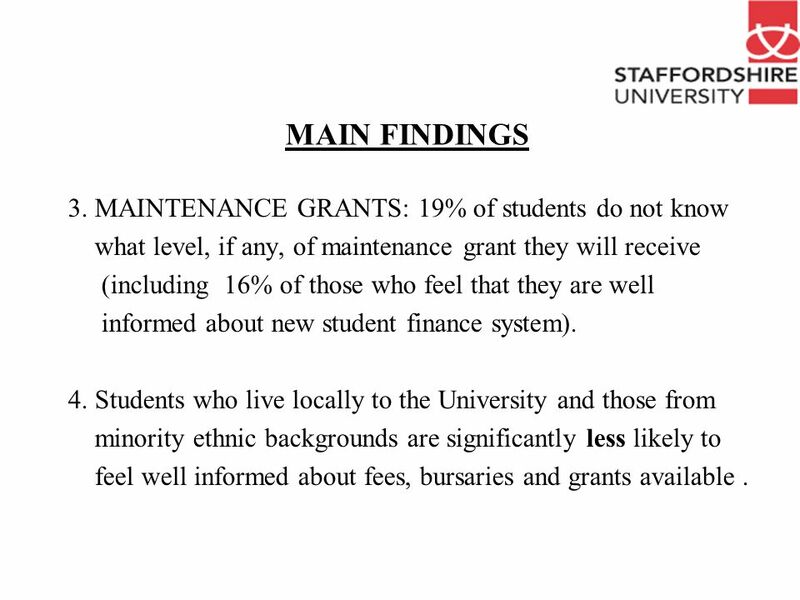 MAINTENANCE GRANTS: 19% of students do not know what level, if any, of maintenance grant they will receive (including 16% of those who feel that they are well informed about new student finance system). 4. 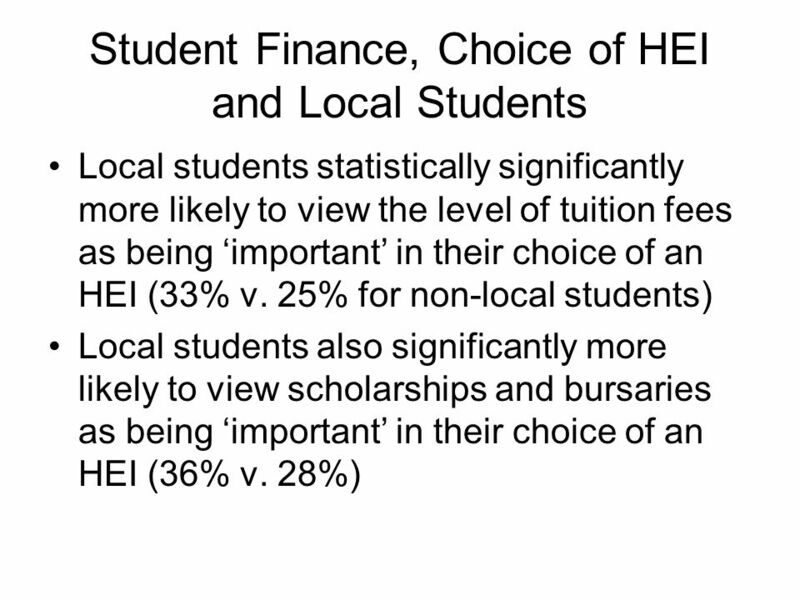 Students who live locally to the University and those from minority ethnic backgrounds are significantly less likely to feel well informed about fees, bursaries and grants available. 16 MAIN FINDINGS Research Question 3. 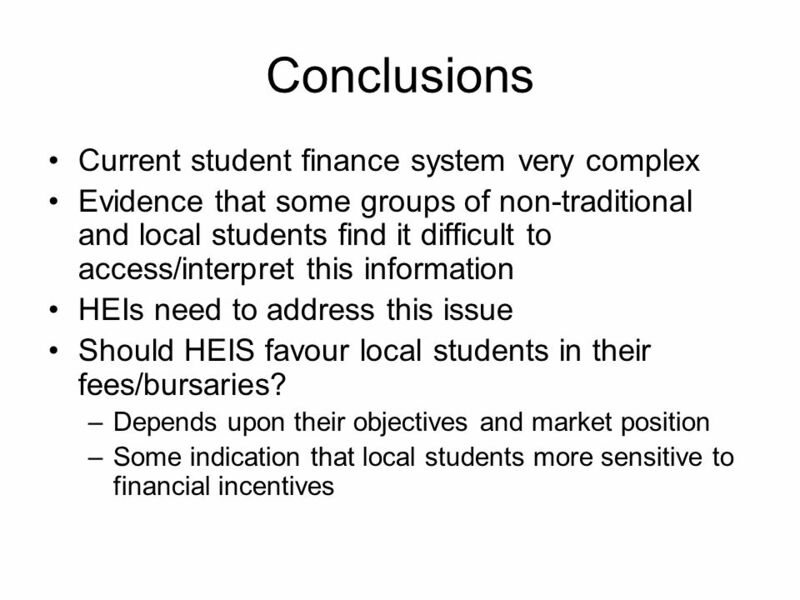 Will the new financial arrangements conflict with the government’s widening participation strategy? 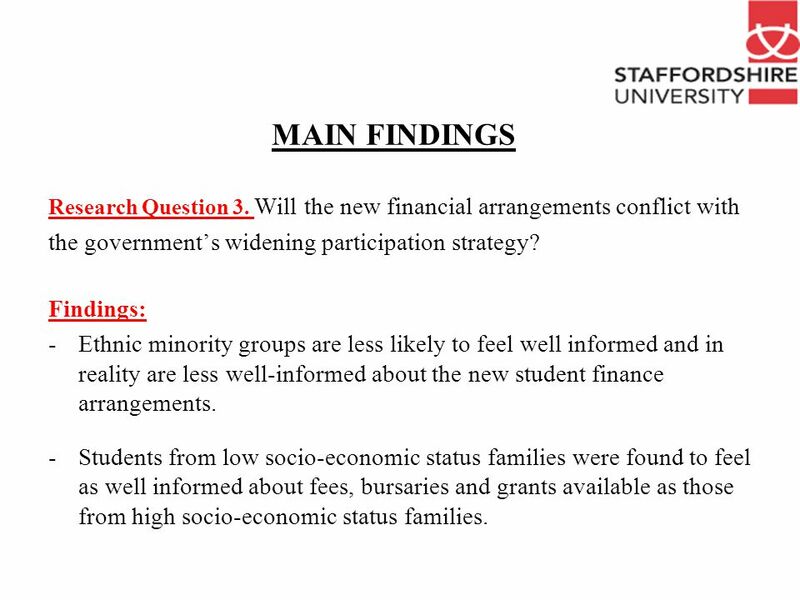 Findings: -Ethnic minority groups are less likely to feel well informed and in reality are less well-informed about the new student finance arrangements. -Students from low socio-economic status families were found to feel as well informed about fees, bursaries and grants available as those from high socio-economic status families. 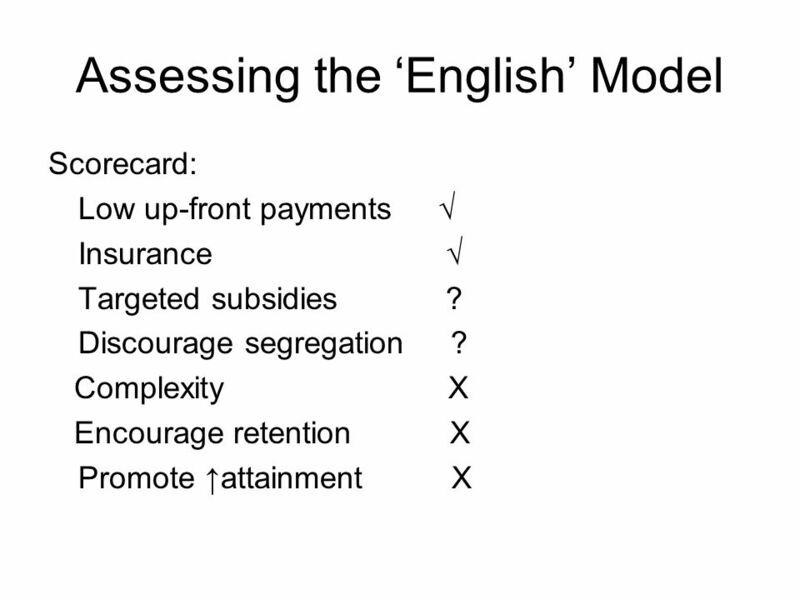 Download ppt "INSTITUTE FOR EDUCATION POLICY RESEARCH Student Finance, Widening Participation and the Local University. Nick Adnett & Diana Tlupova." Youth Radicalization: Website Analysis Paul Baramadat and Scot Wortley. 1 The SEP Gradient, Race, or the SEP Gradient and Race: Understanding Disparities in Child Health and Functioning Lisa Dubay, PhD, ScM The Urban Institute. Joint Information Systems Committee Strategies Conference Focus on Funding Keynote Address by Nigel Brown 7 December 2000. University admissions practices: What is right? What is wrong? How should they change? Steven Schwartz. RCU, Buckingham House, Glovers Court, Preston, PR1 3LS Tel | Fax | RCU Ref Smarter Fees Policies March 2008 Towards Smarter. Learning Objectives After studying this chapter, you should be able to: Answer the question “What is price?” and discuss the importance of pricing in today’s. Presented by Ingrid Pull ©. Student Loan amounts are increasing Grant amounts are increasing New bursaries are being designed and implemented..by each. Professor Les Ebdon CBE Director of Fair Access to Higher Education. MEETING GREATER EXPECTATIONS THROUGH GREATER IMPACT AMOSSHE Conference 2012. FEDERAL STUDENT AID AND COMMUNITY COLLEGE STUDENTS Sandy Baum George Washington University Graduate School of Education and The Urban Institute North Carolina. Thessaloniki, 4 October 2010 Key elements of the Hungarian Student Loan Scheme. ABC. Question 1 Human capital is defined as: The knowledge, talent, and skills that people possess. A The common knowledge, talent, and skills that all.